A cool, refreshing warm-weather recipe that's sure to tantalize your taste buds. Combine Mozzarella cheese, red peppers, green onion, fresh basil, and olive oil in medium bowl; mix well. Season with pepper. Cover and refrigerate 1 hour or overnight. 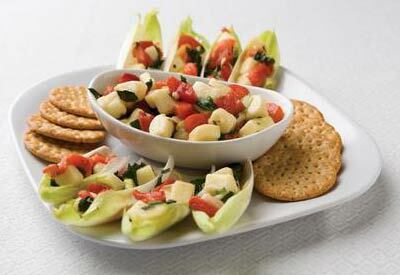 Serve on endive leaves with whole grain crackers. Spoon salsa on baquette-style whole grain bread. Broil until cheese begins to melt and edges of bread begin to brown.